Silversmith Bruce Moffitt presents Stones & Sterling. A geologist by training, Bruce Moffitt has always had an affinity for gemstones and precious metals. 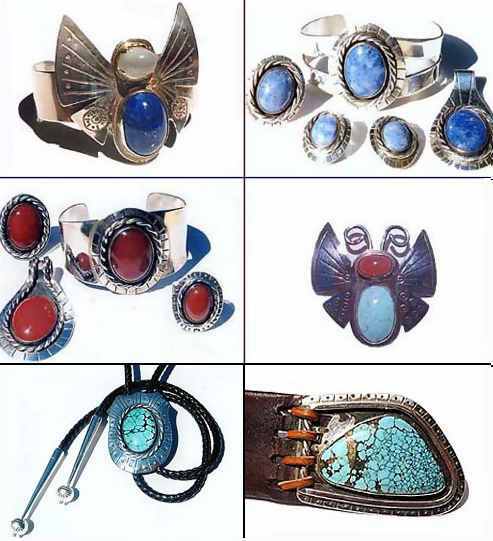 He likes to work in Sterling Siver, and uses Turquoise, Lapis Lazuli, Carnelian, Obsidian, Tigereye and many other gemstones, both precious and semi-precious. A recent aquisition is a small supply of gem grade Australian Chrysoprase. A few Chrysoprase pieces can be seen by clicking here. Here is a recent sampling of his work, including rings, pendants, butterfly jewelry, bracelets, bolo ties, belt buckles and other jewelry. To read some comments by his customers, your are invited to visit the Reference Page. Reward yourself with a new piece of jewelry, or look for a birthday present, Christmas present or wedding gift here. Every piece custom crafted by hand featuring selected gemstones and Sterling silver. Every piece bears the maker's mark.